In mid-2017, a delegation of US congressmen traveled to Santo Domingo to meet with senior Dominican officials and to discuss important matters involving security and development challenges in the country. In fulfillment of Public Law 114-29, approved by the U.S. Congress in December 2016, the U.S. Department of State has been working to finalize a strategy toward the Caribbean. Although the Caribbean basin has not always received the attention that it deserves, it continues to play an important role in the strategic environment of the United States. The country hosted a ministerial meeting of the nations of the region to define the future of the Caribbean Basin Security Initiative (CBSI). The Army of the Dominican Republic took over, from its U.S. counterpart, leadership of the Conference of American Armies (CAA) for the present two-year cycle, granting the institution and the Dominican government an unprecedented opportunity to both demonstrate its institutional capacity, and to shape the work agenda for its fellow Armies across the entire region. From July 30 through August 4, 2017, I had the opportunity to travel to Santo Domingo and interact with academics, businessmen, and senior Dominican security and defense officials. Based on those interactions, it is my perception that the security environment of the country is currently dominated by three issues, reflecting the manner in which the country is integrated into the Caribbean basin and the degree to which it is a strategic nexus in the flows of goods, people, and money through the region, largely oriented toward the United States. Those issues are (1) public insecurity, (2) Haiti, and (3) narcotrafficking. With respect to insecurity, the Dominican Republic is not characterized by powerful violent street gangs such as those found in the countries of the Northern Triangle (Mara Salvatrucha and Barrio 18). Nor is it plagued by warring criminal cartels, as is the case in Mexico. One does find in the Dominican Republic local affiliates of New York-based gangs such as the Trinitarios, and Dominicans Don't Play, yet the threat represented by such groups in the Dominican Republic has been kept relatively under control since 2010, thanks in part to the efforts of Dominican state security organizations. In addition, although there have been indications in recent years of the presence of representatives from Colombian and Mexican criminal organizations operating in the Dominican Republic (coordinating shipments of heroin between Mexico and the East Coast of the United States), such foreign groups do not appear to have more than a representative presence in the country. In the face of significant public concern about street crime (also seen in many other parts of the region), the Dominican government has used its armed forces to support the police, within the framework of Article 252 of the Dominican Republic constitution. In this context, the military has deployed its forces through citizen security programs such as "City at Peace" (Ciudad Tranquilla), in collaboration with the police to reinforce security in portions of urban areas such as Santo Domingo and Santiago. The use of the Armed Forces has produced some positive results through the dissuasive effect of its presence. Yet the forces involved have significant constraints on their activities, including on their capacity to interact with the public. They also perceive themselves, with some concern, as being legally vulnerable to prosecution within the civil justice system, were they to be accused of crimes arising from their conduct of citizen security operations. With respect to the migratory status of a large number of Haitians and others without legal status in the country, the Dominican government has been strongly criticized by the international community for expanding its policies regarding regularizing and controlling such immigrants. Yet it also views with concern and has also struggled to combat illicit activities conducted by such persons, such as the illicit charcoal trade, and the robbery of cattle from Dominican territory. With respect to contraband goods flows, the Dominican Armed Forces are engaged in a continuing struggle against arms and drugs (mostly marijuana) coming into the country from Haiti, driven in part by the increased control over the smuggling of such goods via air and maritime routes (discussed later). Combatting this illicit trade involves, in part, efforts to control informal border crossings (pasos ciegos) in the frontier between the Dominican Republic and Haiti, as well as detection at formal checkpoints, where contraband is concealed in vehicles, to include hidden compartments. The security situation with Haiti, including the control of flows of people and illicit goods, has arguably been complicated by the withdraw of the United Nations Stabilization Mission in Haiti (MINUSTAH). Accordingly, the Dominican government is currently developing a contingency plan to strengthen border control; As a compliment to the work being realized by its specialized land border security force CESFRONT, for example, the Dominican army has reinforced its battalions near the border with hundreds of additional soldiers, and is negotiating the acquisition of Unmanned Aerial Vehicles (UAVs) to patrol the area. 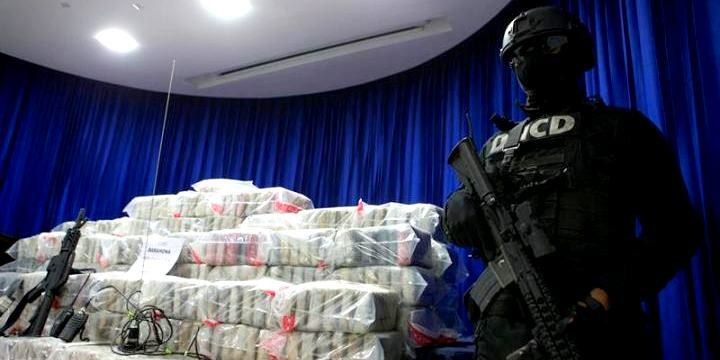 With respect to narcotrafficking beyond the previously mentioned issue of Haiti, the significant increase of cocaine production in Colombia, and the political and economic crisis in Venezuela have increased the attractiveness of the Dominican Republic to criminal groups as a transit point for drugs bound for the United States and Europe. Prior to 2010, the Dominican Republic faced a significant challenge from narco aircraft violating the nation’s airspace and landing without authorization on its airstrips, makeshift landing sites, and even highways, to offload their illicit cargos. Thanks, however, to the Dominican Air Force’s 2010 acquisition of eight Super Tucano interceptor aircraft, such incursions have significantly decreased. Although the Dominican Air Force has not shot down narco aircraft per se, the presence of the Super Tucanos arguably has had a strong deterrent effect. With such enhanced deterrence against narcoflights, it is believed that the majority of the illicit drugs that now enter the country enter via maritime routes . Accordingly, control over maritime smuggling routes has now become a significant focus of attention by the country's national drug control agency (Dirección Nacional de Control de Drogas - DNCD), with the support of the Navy, the Coast Guard, and information supplied by the U.S. Joint Interagency Task Force South (JIATF-S). Such efforts in the waters around the Dominican Republic have also been complimented the use of scanners in commercial ports such as Caucedo and Haina (although a significant number of other port facilities lack such technology). The government has also improved oversight over the country's principal airports, with a monitoring system that passes video and data-feeds involving the airports to the Center for Combined Operations (Centro de Operaciones Conjuntos) in the headquarters of the DNCD in Santo Domingo. Beyond illicit goods, the Dominican government has also stepped up its activities to combat illicit money flows, to include efforts to improve the capabilities of the country's financial analysis unit (UAF) within the Finance Ministry. As part of such initiatives, the Financial Action Task Force for Latin America (GAFI-LAT) is working toward the re-admission of the UAF to the Edgemont Group, and correspondingly the country is in the process of implementing a new financial control law that would strengthen the monitoring of casinos and money change houses in the country. Although the work of the Dominican government against transnational organized crime and public insecurity is far from complete, there are arguably few Armed Forces in the region that have demonstrated as clearly and consistently their commitment as a friend to the United States and a commercial partner. With 1.5 million Dominicans living in the U.S., the relationship between both countries is not merely driven by geographic proximity and commercial interactions, but also bonds of family. It is the combination of such incentives, and the strategic position of the Dominican Republic in the Caribbean basin, that makes the success of the country in its struggle against security challenges such as public insecurity and organized crime, so critical. DISCLAIMER 2: The views expressed in this insight piece are those of the author and do not necessarily reflect the official policy or position of the Department of the Army, the Department of Defense, or the U.S. Government. Dr. R. Evan Ellis is Latin America research professor at the U.S. Army War College Strategic Studies Institute. Almost 5,000 packages of drugs have been confiscated at sea in the first half of 2017. See "Mayorores alijos de drogas se ocupan por via marítima," Diario Libre, July 28, 2017, https://www.diariolibre.com/noticias/mayores-alijos-de-drogas-se-ocupan-por-via-maritima-KY7735408.